How Far is Akshaya Regalia? Akshaya Regalia, a residential project situated in Uttarahalli is developed by one of the well-known developers in Bangalore city Akshaya builders and developers. Welcome to explore a luxurious address in Bangalore. It has everything big space, lifestyle, class. A place which is designed for those who think Big and expect only the finest. Each corner of the project is elegantly planned and tastefully designed to meet the needs of the modern-day home buyers. This project provides the perfect balance of modern and traditional. These homes allow families to enjoy the social life as well as provides graciously private space. 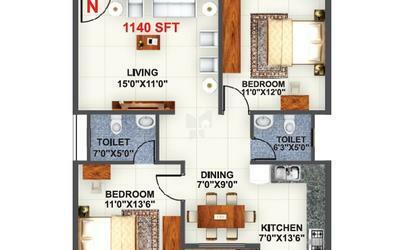 This project offers apartments sale in Bangalore at Uttarahalli locality. The design ensures that privacy & space are optimized. These ready to occupy luxurious 2 BHK apartments and 3 BHK apartments are located in peace & well-developed area with best social infrastructure, the size of 2BHK apartments is 1125 Sq ft, 1140 Sq ft and the size of 3 BHK apartments varies from 1330 Sq ft to 1590 Sq ft.
Akshaya Regalia is located in Bangalore at Uttarahalli locality just 15 mins from Devegowda Petrol Pump Ring road, at Banashankari 6th Stage, being residents of this locality, you can enjoy many advantages, as you will be located close to schools, hospitals, colleges, shopping areas and to other daily needs, along with all these benefits the project is offering many amenities for the benefit of the residents, some of them are Gym, Jogging Track, Badminton Court, Indoor Games, Intercom, Swimming Pool, Multi-purpose Hall, Car Parking, Sewage Treatment Plant, Rainwater Harvesting system and Children's Play Area. 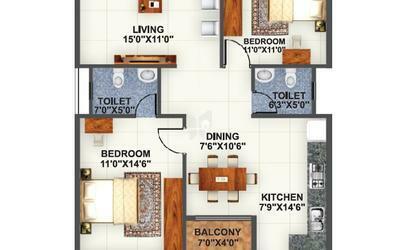 Beautiful apartments for sale in Uttarahalli locality. Geriatric-Friendly park for senior citizens and physically challenged. Building Structure: RCC Framed Structure. Main door : Teak wood frame and polished outer door with Brass hardware. Inner door : Frames with Sal Wood and flush shutters with 30mm BST. Windows: Heavy gauge powder coated Aluminum windows with glass & safety grills on external walls with mosquito mesh. Flooring: Vitrified Tiles in Living Area, dining area, bed-rooms, & kitchen and anti-skid tiles in toilet flooring utility and and balcony. Kitchen: 30mm Granite slab platform with stainless steel sink and dadoing up to 2'0" height. Plastering: Smooth finish in interior and sponge finish in exterior surfaces. Toilets: Ceramic flooring and dadoing upto 7' height with standard fixtures 1 EWC, & one wash basin in every bathroom. (Jaguar Fittings & Hindustan Ware Sanitary or equivalent fittings). Plumbing: With Standard PVC Pipes. Painting: Plastic emulsion for internal walls and cement based colors for exterior walls enamel paint for wooden works and grills. 2 coats of OBD (with a coat of primer & 2 coat of acrylic putty of Asian / Berger brand. Electrification: Concealed conduit with PVC insulated copper wiring with Anchor Roma / equivalent brand switches adequate number of points. Lift: 6 Nos - 6 passengers capacity self-operated lift of OTIS make, with applicable Company Warranty. Amenities: Children's Play Area, Gym, club house, landscaped garden, walk track, Outdoor Badminton Court, Indoor Games -Chess, Carrom, Table Tennis, swimming pool with kids pool, etc. as mentioned in the brochure.